A mysterious UFO crash landed in Russia, Krasnoyarsk, a location close to the powerful “185 Hiroshima bomb” meteorite. The video opens with two bright white lights which can be identified as street lamps In the top left of the screen a green “ball of light” can be seen moving rapidly towards the ground. As the car continued to drive forward on the snow-covered road, the dash cam showed the green light turn to bright white before changing colour again to orange. The light then disappeared in the distance after lighting up the night sky. The footage was captured near the impact site of the Tunguska meteor that struck the region in 1908. The impact of the Tunguska meteor was estimated as being as powerful as 185 Hiroshima bombs. A witness to the latest odd phenomenon, Pyotr Bondarev, said: “The night got bright and warm as if a giant light bulb was switched on in the sky. “It was about 7.30pm, it was dark, I was outside having a walk with my wife and children when the sky flashed green and yellow. “Many people saw it and got very excited. 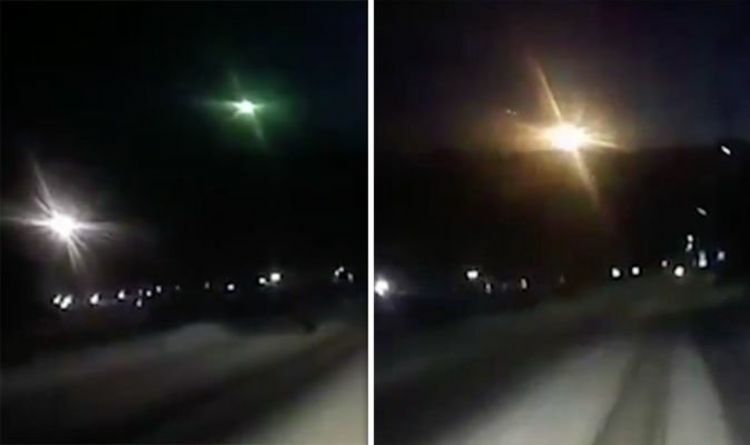 Some experts have theorised that the object seen striking over the Siberian hills was a meteor but no conclusive evidence has been attributed to the idea. No crash has been reported and no debris has been retrieved from any landing, experts are maintaining an open mind however about the possibilities of the strange night sighting.